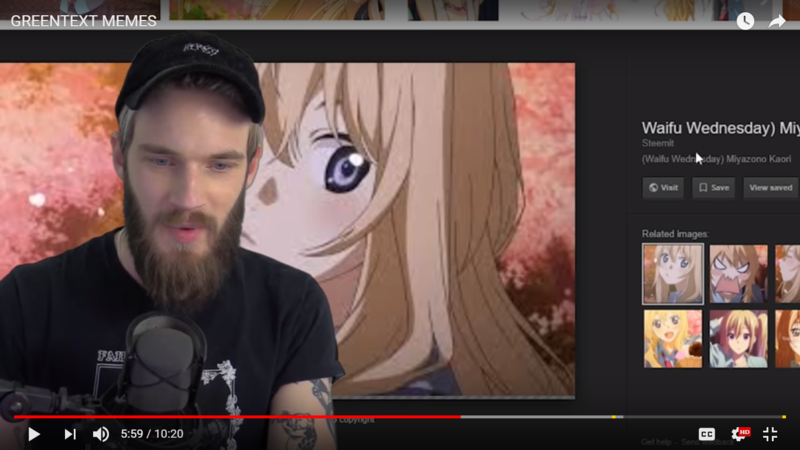 STEEMIT In Most Subscribed YouTuber PewDiePie's Video! Yesterday Swedish YouTuber PewDiePie uploaded a video titled 'GREENTEXT MEMES' in which he talks about a certain type of new and upcoming meme. This guy's channel has about 61 million subscribers, making him the most subscribed youtuber on the platform. In this screenshot from the video, you can see a picture that was taken from a steemit post and shows up on google images. How do we know its from steemit? On the right side of the screenshot, just 'Waifu Wednesday', it says Steemit which is how google lists the source of the website the image was taken from. It's only been a day since upload and this video has over 2.6 million views. Usually, PewDiePie's videos get 4-5 million views in a few days. For steemit to be in one of his videos is really cool. Granted that he actually doesn't talk about Steemit in this video, but this video will have a massive reach. Hopefully, some people will be curious enough to checkout steemit and learn about the steem blockchain and be a part of it. Congratulations! This post has been upvoted from the communal account, @minnowsupport, by Sqamemal from the Minnow Support Project. It's a witness project run by aggroed, ausbitbank, teamsteem, theprophet0, someguy123, neoxian, followbtcnews, and netuoso. The goal is to help Steemit grow by supporting Minnows. Please find us at the Peace, Abundance, and Liberty Network (PALnet) Discord Channel. It's a completely public and open space to all members of the Steemit community who voluntarily choose to be there.